Know someone FRAZZLED or SAD this Christmas? A Better December by Steve Estes applies Solomon Proverbs to holiday stresses. Playful and tiny, this illustrated work would be a good gift for your unbelieving friends as it gently introduces Jesus during a month when they are more receptive. For All Who Long for True Comfort and a True Home. Combining true, heart-warming stories with pen-and-ink illustrations, the book uncovers and answers our December longings. Beginning with bite-sized chapters of Solomon s advice to frazzled, lonely people at Christmas, Steven Estes presents the ancient sage as penning his blockbuster Proverbs to help future readers through holiday stress and even sadness. Meant to be shared with all who long for a better December, it points the way to true comfort and a true home. A Better December is an ideal gift book for non-Christian friends and neighbors with a gradual, non-threatening introduction to the gospel." 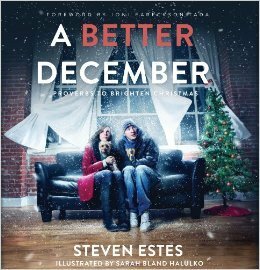 A Better December: Proverbs to Brighten Christmas is a good and enjoyable short book. It is fun, at times funny, sweet, thought provoking, delightful, inspiring, and full of wisdom. Any reader would gain something from reading this. Those who are too busy to read, would have no problem fitting this into their daily life. I give A Better December: Proverbs to Brighten Christmas four and a half stars. It would make a perfect gift. I recommend it.